He is sitting next to me in a quiet, empty restaurant, talking with his thick voice and a strong rural accent. He is in his late 50s, looking a decade older than he actually is, tall and thin, always sitting straight, always looking you in the eyes. I have just asked him what the sesame plant looks like and all of a sudden the story of its cultivation begins unfolding in front of my eyes. I can picture him, a 10-year-old boy in the early 70s, sowing the sesame seeds in the vast, sunny fields of northern Greece. The sesame plant is a short bush he says, which loves well-drained, fertile soils, making it ideal for cultivation in warm climates. Its seeds hide in its flowers and when it is to be cultivated, the flowers are cut from the plant and their content is sowed in the fields. There, they remain untouched, growing with little water until the day of the harvest arrives. When the plants grow to 50 cm, they are uprooted, the sesame seeds are released and they are piled in mounds to dry. Before they are stored they have to be winnowed by throwing them by handfuls towards the sky so that the air removes any unwanted material like soil and crushed dried leaves. Back in those days in the small village where he grew up, the sesame was cold-pressed in the same press as the olives and its oil would be released. Although not as flavourful as olive oil, it would be enjoyed no matter what, as their diet relied solely on the food they produced. A village of no more than thirty people, all of them strong and thin, all of them part of the land. When the children weren’t at school, they were in the fields helping their parents to cultivate the land. By cultivating and harvesting, the blessed Greek soil would give its rich produce to those who tended to it. During the 80s, with the development of technology, the cultivation of the sesame plants gave way to other, more profitable cultivations. Sesame seeds rely solely on being collected by hand, he says, and for this reason, nowadays the world’s leading sesame producers are countries where labour is cheap and the climate too dry to produce much else. He pauses for a moment and I feel eager to ask more. But now he seems to be left behind on the land of his ancestors. His movements while describing the procedure were vivid as if he was there, fifty years ago, a sun-kissed boy digging the soil. 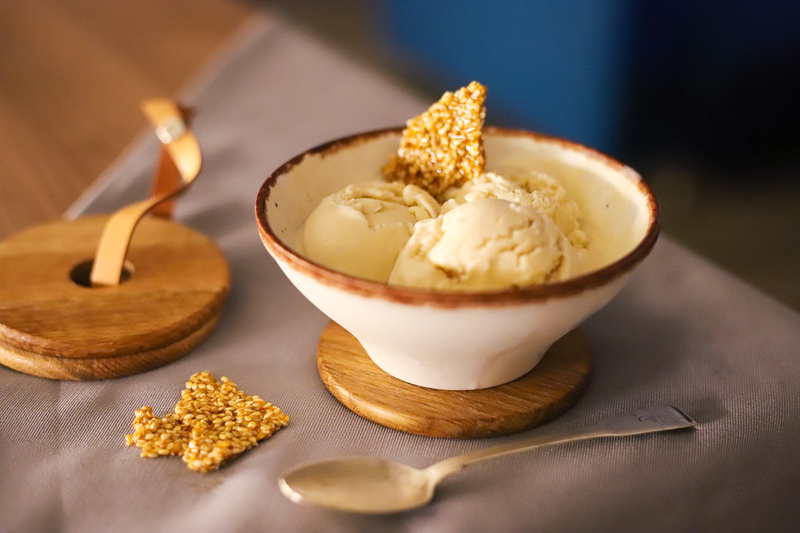 We now eat quietly, while my own mind slips to the warmth of my kitchen and the movement of my hands while making this tahini ice cream. 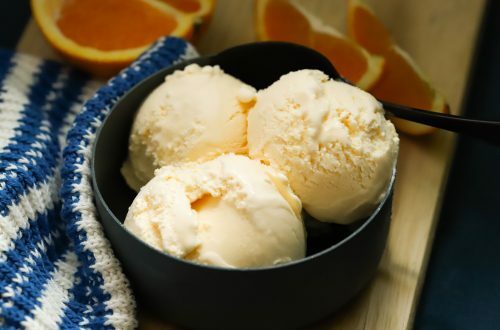 This ice cream is perfect for winter. 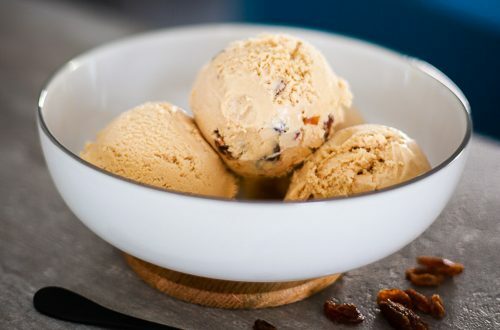 It has a warm, lovely nutty taste with nothing of the stiffness of the tahini paste. For this recipe you will need a 100% tahini paste. It has to be good enough to be eaten plain with a bit of honey on a slice of toasted bread. In a cup put the corn starch and a ladleful of the measured cold milk. Whisk with a fork to dissolve the corn starch. In a large heatproof bowl put the tahini and pour the corn starch paste on top. Give everything a stir with a silicone spatula. Keep a ladle nearby. In a large saucepan pour the rest of the milk, milk powder and sugar. Warm on moderate heat stirring often with a rubber spatula until it begins to steam. Using the ladle start pouring the hot milk into the tahini, a ladle at a time, whisking well before each addition. You will not need to add all the milk, just enough to sufficiently homogenize and thin it to a fluid consistency. Pour it back to the saucepan and warm it while stirring constantly with a spatula. Stirring has to be done, aiming to avoid any milk sticking to the bottom of the saucepan, so scrape the bottom with the spatula as you go. When the surface begins to bubble, set a timer and keep stirring constantly for 30 seconds. Pour the thickened milk mixture to a large heatproof bowl (you can use the same you put the tahini in before, no need to rinse it). It is quite useful to keep stirring with the spatula for 7-8 minutes after removing it from the heat. This will help release the steam and cool it down faster. After that you can put it in an ice bath to cool it down completely. Once at room temperature, put it in a container with a lid and leave it in the refrigerator for 8 hours. Given that the milk is fresh, you can safely keep it there for up to 3 days. Demerara sugar : is a variety of raw cane sugar and gives depth of flavour. You may use any kind of raw cane sugar you like, as long as it its light brown in colour. Regular white sugar works well too, although it doesn’t help in building flavour. Tahini paste : only use 100% tahini paste, with no other ingredients included. If there is oil on the surface of the product, you have to stir well before using it. The separation of the solids and oils is the naturally occurring phenomenon of this totally natural product. Stirring well the tahini, while troublesome as a procedure, insures that the oils will sufficiently blend with the solids.